Howard and Debbie Miller take their veterinary skills to India, assisting in remote places with needed animal care. By giving this basic care, they share God's love with these communities. What a joy to be back in Leh, Ladakh after a two-year absence. When Howdy received an 'all-clear' from his pulmonologist in February we immediately made plans to return for at least one more time. For awhile I was not sure we would make it: our first flight was cancelled due to computer problem as we lined up to board, the reroute landed in London but steering mechanism prevented taxiing to the terminal so we missed another flight, we finally got to Leh but our luggage did not... as of today (Tuesday, March 27) we are finally all together! Yesterday we spent part of the day at the nearby village of the guest house manager, a delightful young lady whose father worked in the Animal Husbandry department here for 41 years. Unfortunately, many people were away so we did not treat many animals, but it was a good trial run. Tomorrow we leave for Matho, the large village about 40 minutes east of here where we will work until Saturday afternoon, then return to be ready for Easter service Sunday morning. We may need to return later if we can't get through all the farms. Either Sunday afternoon or Monday morning we will take the bus (Rev. Gergan has retired as headmaster of the school so we have no access to its trucks and drivers) out to the township of Khalse, 77 miles from here but about a 3 hour trip. We hope to find a ride from there to both Wanla and Skindyam, the villages we have enjoyed serving in the past. After that, we will need to find a translator for the last villages SW of here along the Zansgar River. Because many of you have been reading these journals for several years, I don't want to bore you with repeats of the same stories, but focus each entry on a particular aspect of either the place or our work. Since many changes are taking place in Leh that are both disturbing but inevitable, I guess, that will be my first chapter. Leh town is old--it is mentioned as a stop on the Silk Road and probably inhabited for nearly 1000 years. Mud bricks are the building blocks, framed by poplar trunks. The ceilings are layers of poplars (or cottonwood), from the lowest layer posts about 10 inch diameter to tightly placed 2 inch diameter branches laid crossways. These trees are grown in abundance and harvested, not cut down but severely pruned every few years. Because of this construction, the old buildings were no more than 2 floors, but several rooms in each house. Commercial buildings are small, a garage door wide. The old pictures from the 1880s when cameras first came show the bazaar almost exactly as we observed it the first few years here. Today: this area, fairly safe politically and geographically for trekking, is very popular in summer for mostly European and Israeli hikers (Americans come to the Himalayas to climb the highest peaks), and has become a destination for winter Nordic skiing. In addition, it has been discovered by the sub-continent Indians who come to see this part of their country (ten years ago at the Delhi airport no one knew where Leh was!). So, instead of the smaller guest houses that began as an extra room rented out, now innumerable--I mean many!--hotels are either under construction (weather just recently warmed enough to allow workers) or are completed. These are large buildings four to five stories, taking all the tillable land inside the city and obscuring the awesome view of the mountains except from the rooftops. The guests in these lodges will not taste the historic Ladakh; instead they demand running water, heated rooms and continental cuisine. We understand that many property owners take out large loans for these projects, but the main tourist season is only from May to September so debts must be recouped in a short time. Leh has no zoning, no building codes and only now a sewer system. Water is from wells, but with warming climate the aquifers will not be restored as quickly as they are drained. Full disclosure, ala NPR: Siala, the guest house where we stay, now has a radiator in each room to ward off the chill (we still wear light jackets inside), hot water so no more bucket showers, and several more rooms, including an underground breakfast room. I mentioned a couple years ago that whole blocks of old structures have been torn down to make second lanes for autos, of which there are so many that we saw a traffic cop at the main roundabout! Now the old mosque at the end of the bazaar, built in 1666, is being demolished. Main Street (the bazaar) was totally torn up in 2015 to put in the sewer lines; when that was complete the two blocks were lined with colorful pavers, benches and planter boxes and closed to all traffic. Actually, that is a positive change as people can walk about w/out jumping out of the path of cars. Now other streets are dug up for the lines; no barriers so one must watch his step to avoid a fast trip down 20 feet down. We have noticed that many of the locals now use torches (flashlights) at night to avoid such hazards; we used to be the only ones lighting our way back from Gergans or the bazaar. Well, this is enough for one letter; I hope not too much. Please let me know if you are tired of reading these accounts and we will take you off the list. Or, you can find the Delete button. If someone you know would like to receive the notes, an e-mail to us to get the address is all we need for anyone to be included. We wish you all a wonderful Easter as we celebrate the resurrection of our Lord and the hope of eventual peace. We love letters, so write whenever you have a minute. Well, I am trying this second note again--yesterday afternoon, after typing for nearly an hour, the power went out and so did my letter. This one will be sent as soon as the last word is written. I know this may be arriving soon after the first chapter, but we do hope to leave tomorrow for the western villages (Skindyam and Wanla) and will be gone for about a week if we can get a translator. I wanted to describe for you a bit about the general geography of this area and life in one of the villages. The Indus River, as you may recall, flows from Tibet through the northern part of India, making a valley between Himalayan peaks, then turns north into Pakistan and finally south into the Bay of Bengal. This valley, in which Leh is the only town of a reasonable size (about 30 to 40,000), is about 125 miles east to west and ranges from several miles across on the eastern part to very narrow passages in the west, finally ending at the climb to Lamayuru. The only actual flat land is right on the river, then on both sides the terrain slopes gently up to the wall of the mountains. I say these are gentle slopes, but that was before we walked up about a mile. Mathow is about 15 miles east of town, situated on this slope at about 12,800 ft. elevation rather than a canyon, as are most villages in the west. So, not only is it a large settlement of about 300 homes, but very spread out, w/ plots of one to five acres for each house. The soil is clay and much deeper than the canyon fields, so much grain can be grown. We were surprised to see so much alfalfa on the roofs this year; usually the farmers have only a bit to feed, relying mostly on barley straw. We have stayed w/ the same family each visit, so returning is quite fun. Many old houses have been vacated for new structures in the past few years, including that of our host and translator, Delden, who lives in his parents' home along w/ his wife of about 3 years and now their 1 1/2 year old daughter. Their new home, like so many others, is rectangular in shape, a hall down the center from front to back door. On one side is the living area--the new homes have a reception or living room and a separate kitchen where cooking and some meal prep is done, still on the floor as the counters are quite narrow, only about 12 inches, enough space for the LPG-fueled stove and cooking pots. A wood stick-dung fed stove in the middle of the reception room provides heat and a steady source of hot water; theirs even has a small oven tray for baking biscuits. As in all homes, there is no furniture, just the mats covered w/ colorful rugs along the perimeter and the low 2 foot long tables that can be moved to whoever needs a place to put tea cups or a plate. Geraniums and lilies in large pots are on every window sill. The last rooms on the east side are for storage. On the other side of the hall are several rooms used for sleeping or other purposes as needed. We use the first room, Delden, wife and baby in the next--their only privacy--and parents in the third (except that father usually sleeps on a mat in the kitchen). The 'facility' is out the back door, across 15 feet of yard, and up 6 narrow steps. The only positive at 1 am is the number of stars to be viewed and, last week, the beautiful full moon. And for babies--they wear long pants that have lots of padding in the seat area; the whole piece is changed occasionally and either washed or, I wonder, just dried near the fire. When needed, the child is taken outside and held, bottom up, while another parent pours warm water to cleanse the area. We have seen disposable diapers advertised on TV, but I am sure they are expensive and contribute to pollution. You will see pictures of babies and toddlers w/ a soot mark on their foreheads to ward off evil spirits as the child is no longer 'perfect', a Buddhist belief. Delden's dad, about 68 years old, is of slight build and very quiet; he still farms some and is proud of his large greenhouses that grow greens and other vegetables--we had his good spinach sautéed over rice. When he sees us emerge from our cold room in the morning to the reception area he immediately pours a glass of Chu skol (hot water) for us--that drink begins each day for every Ladakhi. Then he serves us milk tea and finally a cup of Ladakhi tea. He speaks little English but takes this responsibility seriously and happily. Mom, on the other hand, is plump, has a henna tone to her still dark hair, and very effervescent w/ a high-pitched voice that can pierce the air. She is cheerful, laughs lots and seems so happy we are there. She minds the little girl while mom and dad are at work, Delden still teaches at the monastery school for the boys who will become monks, and his wife at the Ladakh pony farm office in a nearby village. As customary, his wife does most of the housework, they both prepare food and cook, but she seems to have a good relationship w/ her in-laws. Since this village has power much of the time, they have a TV on in the morning (24 Hour News, but in Hindi) and evening Bollywood sit-coms that are awful to watch, even if we don't understand the words. Now to the animals: since Mathow is so spread out, we are grateful Delden has a car, a Suzuki small van that can hold about 8 w/ bench seats facing each other and 2 bucket seats up front. We load our bags and start out about 9:30, covering one lane at a time asking if anyone would like to have his animals checked. As we meet the farmers (wives usually know more about the state of the beasts than husbands) the usual greeting is to hold the right hand up to the face at right angle, forefinger near nose, then both hands to a prayer position. Alternately, some men give a quick cupped-hand salute. As usual, Howdy mostly gives worming meds and checks coughs and other concerns. Rather than the animals staying under the house, as is typical in the steep terrain, these critters have small barns or stables, which is better for parasite control, as they are more easily cleaned (if owner wants to), yet most still eat off the ground so are constantly reinfected. One of Howdy's pleas is for mangers, which would be quite easy to install and so effective. We noted that some homes had no animals, others only 4-6 cows, but some were swarming in sheep! Thursday afternoon we were up at the highest part of Mathow, a great view across the valley, but so very cold as the wind came up and the sun was behind clouds. We waited in a yard for nearly 1/2 hour before the 90+ sheep were rounded up and corralled so they could be wormed. A few other families had large flocks, others only 10-12. This time we saw several animals w/ severe birth defects (perhaps too much inbreeding) that, sadly, Howdy could not help. One was a large calf w/ a condition known as acanthosis--front half was fine, but the vertebra curved about the lumbar area so the poor thing looked as though it was sitting on a chair. Then another small calf was not able to get up at all, 4 legs splayed out from the body w/ no strength in the joints. It also is untreatable. SInce Buddhists do not usually kill animals, we wonder if they will continue on in their misery until natural causes cause their deaths. I have a particular fondness for burros as they are so friendly and love to be petted on their dusty heads. One little guy had broken its foreleg a few months ago and it was not set properly so he was trying to walk on the carpus (wrist) causing sores. The owner thought Howdy could re break the bones, but they had healed completely, though not correctly. He did bandage that leg up so the animal could learn to use 3 legs and not cause damage to the fur and skin of the injured leg. A very interesting case, also incurable, was a cow that had conceived twice but lost each calf at about a month along. By palpating, Howdy could feel that the uterus was quite small, but then, just forward of those organs, was a large, soccer ball sized mass that was taking up the space a fetus would normally, and actually starting to press on abdominal organs. He could not determine what exactly it was, but could explain the damage it was doing. We are always sorry to say we can not help, but hopefully that will keep the owners from seeking superstitious cures that cause more harm than good. In all, Howdy probably treated about 300 critters, more cows (balong) than in other places. We plan to return to Mathow after other areas, as we did not get to the entire village in 3 days and he wants to recheck a slow w/ serious pneumonia (temp was 106!) Delden was able to take off from school for which we were grateful, but still had household and farm chores. We usually stopped about 1 pm for lunch--rice w/ lentils and/or root veggies in a broth poured over. Dinner was usually a pasta--once they had purchased noodles rather than making them. The last night she prepared momos, which are a real treat. Everyone is talking about the road from Srinagar, 260 miles west, now open so fresh fruits and veggies are for sale at all the little stalls in the market place. The downside of this early opening is that less snow fell this year, so less water will be available in the summer. This is enough for one reading, but I hope you get a feel for the area and people. We love to find letters in our in-box when we return. Thank you for your prayers and good thoughts for us. A cool Wednesday morning here in Leh as we sort a large mound of very dirty, dusty clothes from the village trip to take to the laundry. Oh, the luxury of not washing clothes and preparing meals! What pampering. We returned last evening from a week at the villages in the west, a wonderful time greeting the farmers again and helping with the animals. Today I will write of our time in Skindyam (spellings are up for grabs, but that is about the way it is pronounced). This is Howdy's sentimental favorite as it was the place where he did the herd health assessment on his first trip to Ladakh in 2006. So, returning was important to him. Our translator/host in Wanla, the other village further west, was not available until the weekend, so we decided to head for Skindyam on Wednesday, about 60 miles to the township of Khaltse and then 7 miles north. The highway (NH 1) was but a cow path, then a walking trail and 10 years ago a partially paved one-lane road hugging the cliff above the Indus River. Now it is almost all paved, 2-lane (narrow, admittedly) and bridges rather than having to go down to the water and crossing on planks. This is mostly for military purposes, but puts the trip down to 2 hours from 3. Our concern was that we did not have a translator for S. We had contacted Samson, the pastor of the tiny Moravian church in Khaltse w/ whom we have stayed in past years, to ask if he knew of someone. Finally, he said to come ahead on Wed. and he would have someone for us. Samson, totally unlike Pastor Gergan, is short, stocky and very volatile. Sadly, he is not a happy man and seems to think we (and probably others) are an inconvenience to him when we ask for assistance. Yet, he is our only contact in Khaltse. So, we arrived about 1 pm only to have him say he had not found anyone--"very difficult, very difficult" were his chosen words, and a lengthy explanation about the crackdown on moonlighting by the government--on it went. Finally, he asked what we would like to do. We said "go to Skindyam and work!" More "very difficult", yet he agreed to drive us up the narrow, steep windy road to the village, even though we had no translator. I explained that we could find housing, having been there several times, and could get along in the evening, but could not work w/ the animals w/out translation. The main thing, at that point, was to get out of his office and up the hill, hoping he might come through to get us out of his hair. Remember the verse you may have learned in Sunday school as a child: "My God will supply all your needs according to His riches in Heaven". Well, we leaned on that and were rewarded: as we drove up the road, we passed a young woman about 2 miles along (very common to see villagers walking; any car will stop to give them a ride). He stopped, said something to her, and told her to get in. She turned out to be a college student who, we think, just finished at Jammu and had come home for a couple of week, then plans to be off to Leh looking for work. He determined her English was acceptable and asked/told her to work of us. She agreed!! What an answer to prayer and a relief? We returned to a home where we had stayed twice in the past; lady was very welcoming and now her husband, a retired police officer we had never met, was at home and also greeted us warmly. They were such a fun couple, working together to cook and care for the animals. He was almost too attentive to us--oh, so much tea! But, always a smile. He knew a little English and we are pretty good at charades. They have built a partial second story onto their flat roof, so we stayed upstairs (one goes up the steps, onto the roof and into one of 3 rooms there). It even had an open-air 'facility' so we did not have to negotiate stairs at night, but could be out under the stars. Dolma got a crash course in translating, but was a good sport and so very conscientious. We walked around the village that afternoon, just saying hello and announcing our arrival and availability to help. We were met by big smiles and the question "Why weren't you here last year?". As I have described before, the village sits in two different canyons at right angles to each other, both carved by small rivers or creeks, as we would say. Our house was in the wider canyon oriented north-south, her home was across the stream. A new bridge at street level was easier to use than walking down the bank to the wooden bridge and then hauling back up the other side. Thursday morning she was at the house at the time we suggested, ready to go. We started on her side of the hillside, checking in and finding some animals in good shape and others ready for worming and vitamins. Always the invitation to tea--some afternoons I felt as if I would start 'mooing' after so many cups, even though we turned down many. Most of the houses on that canyon are about the same distance up the hill, so we did not climb too high; then, we crossed over and started up the other narrower canyon. Most was routine, but a few exceptions. First, Howdy was really protected from a potentially disastrous situation--he was giving oral meds to a dzoh, the large cow/yak cross used for plowing and threshing due to their strength. But, all have long, heavy horns. This one suddenly turned her head and grazed his face w/ a horn--had she caught his mouth she would have ripped it open, but just brought blood to his cheek. Very scary. The villagers all knew w/in 15 minutes and he got a lot of sympathy; I think they were quite concerned. Then, I had to give Dolma a brief lesson in anatomical nomenclature. As we approached one pen of sheep, she said the owner had said, "uterus out". Oh, a prolapsed uterus (when it inverts and comes out) is a nasty proposition, as it is dirty from dragging, and the muscles holding it in have been weakened so it does not want to stay in place. We went into the area looking for the poor ewe, but did not see any evidence of this problem. Then, the owner went up to a little guy, (not a female) and pointed. Oh, the uterus was actually the testicles that she wanted out. Howdy ended up doing several neuterings; he brings a surgery kit (these are non-invasive procedures, unlike a male dog, etc) so can be done on a mat or gunny sack using lots of disinfectant. The man Howdy had first met when there in 2006 was so happy to see him and asked us for dinner Friday night. Their son, now living in Leh, was back home for a few days to help spread the manure which will provide nutrients for the poor, thin soil, so he cooked most of the meal and provided the translation. Usually evening meals are a pasta of some sort; he made sku--the dough is rolled thin and cut into narrow strips, then broken off by thumb and forefinger into little squares which are put into a broth of veggies and cooked as we would spaghetti. I so wished the veggies could be washed before slicing and dicing, but the dish water is not very clean either--guess boiling for 15 minutes kills most of the germs. We had a delightful evening basking in this old friendship even though the language barrier is great. After lunch one day we climbed to the highest house in the village--oh, that was a workout! Thankfully, the woman had some animals to treat so the trek was not in vain. By Friday evening we had seen every house in the village and only had a couple of rechecks to do Saturday, so reluctantly called Samson from the one phone (no cell towers there yet, a satellite phone in one home) to ask about getting back down the hill Saturday afternoon, and if he would call Namgyl, our contact in the next village. He finally agreed to come get us after school was out at 2 pm., so we gathered our bags, had a good lunch w/ our hosts, said our goodbyes, and waited for the car. Next time, our trip to Wanla and such a good time there. A little other news--weather is warmer than usual over all; as I mentioned, so little snowpack and no spring rain. I so wish they could store some of the water now coming down the creeks that would give them irrigation for the summer. Everyone is worried about water; glaciers are melting so rapidly and temps are warmer here, as across the globe. We have not felt the brutal cold as before. We have had dinner w/ the Gergans every night while in Leh; I did not want to be a burden but they welcome the company. So many holidays observed by the government--Hindi, Muslim, state and (at least on the calendar) a few Christian holy days. We have to be careful of having enough money to get through what might be 2 days in a week the banks are closed. We love hearing from you and appreciate the letters we find in our in-box. The internet is up (!) so I will try to get a note out before service is out once again; more down time than use for the past several days. I ended the last chapter with a ride down the narrow, steep canyon road into Khaltse w/ Samson. He assured us Namgyl would not be coming to take us the15 or so miles to Wanla so we would need to take a taxi. We agreed, but begged to take a shower at his home as we were so dusty and dirty. This did not please him but he finally filled a bucket w/ hot water; we had our own soap and towel. Then I asked him to please call a taxi as we did not know anyone nor where the 'taxi stand' was in the township. He tried a few numbers, then declared no taxis were available. That left us in a bit of a dilemma; the public buses do not go clear to Wanla, as that is a turn off from the NH 1 which goes to Lamayuru. Finally, he grudgingly offered to drive us out if we would pay for the petrol. Agreed--let's go! Oh, about 3 miles west of Khaltse the road splits, NH 1 continuing SW to Lamaruyu and Kargil, the north choice following the Indus into Pakistan. There is a border check point where foreigners must register and present passports. Always before, whoever is driving runs up the steps to the small office, explains we are headed to Wanla and is out in 5 minutes. Samson did not want to go in so sent Howdy. Minutes dragged by, then more, still no sign of him. I was in a quandary, if Samson went in and was rude or angry, we could be in trouble; yet, as I told him, if the officer in charge spoke no English and Howdy speaks no Urdu, this could be a long standoff. Finally, he did go in and learned the man behind the desk was confined to "just a minute" in our mother tongue. He finally called for a superior just as Samson entered the office. Between the new man and S's explanation, we were finally on our way in a few more minutes. Namgyl and his family, a brother and two sisters were there, as well as his wife and 3 year old son; daughter is 5th class in Leh. His mom was absent, we never learned if she had died at a fairly young age or was visiting relatives. The house sits in the canyon on the other side of the main street of Wanla, which was built on a very steep hillside. One can walk around on the road from one area to the other or up and over the trail. We were dismayed to see that a very localized flood in summer of 2014 swept down their canyon, (much narrower than the road, hillside homes and riverbed in main part of village), missing their house by a few yards. Rocks and debris are all over, fields still unusable. Again, we were warmly welcomed and went on a walk-about before dinner. As we stopped to say hello along the main road, the sheep were all coming down from the higher pastures where they had spent the day looking for blades of grass. One was carried by the shepherd who explained a 'shooting stone' (falling rock) had hit its leg and broken the femur. He lives near N. so we suggested he bring it over and Howdy would try to set it. That went well, we hope--the brother fashioned splints from small pieces of wood as we had not brought casting materials; after washing the wounds, he wrapped and taped the splints into place, then wrapped more to secure the pieces. We have seen good healing from fractures and also very sad results where the bone was not set properly and the animal had little use of the leg. Let this be a success! We chose to be in the village on Sunday because Namgyl now teaches in Lamaruyu, at least a 30 minute drive to school, yet could work w/ us all that day. Early in the morning we walked the mile and half up to the tiny village of Shilla (pronounced Sheila) which had also been impacted by the flood nearly 4 years ago. These happen at night in August, the monsoon season, when torrential rains just wash water down these narrow canyons, taking everything in their paths. Besides the usual, Howdy treated both a lame cow and dzoh, promising to return for a recheck a couple days later. We asked about the girl we had first met 8 years ago when she was about 5; her freckles and lighter skin told us the village had some Dard (ancient people from Afghanistan area) influences. She is now studying and just passed the 10th grade exams, a must to continue one's education. The Buddhist nun w/ bright smile was shoveling manure as we have seen her helping families most years. Other families had children we had first met when they were toddlers now helping tend the animals. That is one of my favorite places, so seeing everyone and treating their livestock was a pleasure. We will send pictures of the 3-branch bridge to the engineers in the group--so much easier to construct than those pilings and posts! Of course, getting one's get wet is always a possibility. I decided that 'pride can goeth before a fall' so gratefully took Namgyl's hand to cross. That was the warmest day we have had, yet Monday was quite cool and windy, needing jackets to be outside. After lunch of rice and lentil stew, we headed for the main area of the village where we went house to house as usual, By evening, we had walked, huffing and puffing, to the very top house of the village, right underneath the monastery. We saw a goat w/ large abscess in a dark pen built into the side of the mountain under the house. Howdy promised to care for it the next day in the light; we had another similar situation so we were to meet at one place to care for both the goat and a sheep. Other than that, our day was routine w/ worming and vitamin B injections for weakness (generally less energy), some dehorning where the horn was growing back into the skull--otherwise, horns are always left on. He also was asked to preg check several cows and a dzohmo (female dzoh); not many US vets can put that on their resume! After carefully following the shortcut trail to their home as darkness fell, we watched Animal Planet on TV--so much better than Bollywood!! while they fixed dinner for all. The little boys, his son and nephew about the same age, stayed up until after 9 pm and go to school from 10-4 every day! They are learning how to print and to count in English; moms helped them fill out their workbooks. Monday we were on the trail at 7 am, finishing the main road. The most serious problem encountered was a sheep w/ pneumonia; it was straining to breathe. Namgyl had to clean up and leave by 9:30; the farmer came w/ sheep to have leg set, and then we waited, reading and writing, until 4:30 when we could start off again. A few more calls and then we met the two abscessed small ruminants for cleaning out and treating. By that time, light was fading and we were working under the assistance of two bright torches. One was an infection from a bite wound, filled w/ pus and nasty. The other was an old wound that needed debriding and cleansing. Both looked better afterward, hope they felt relief. Again, we walked back in twilight--I am hesitant to be on non-level ground since falling 2 years ago, but kept up and arrived home safely. Each host family wants us to have traditional Ladakhi fare for meals, which we enjoy. One night the sisters made temo, a pasta made by rolling the dough out thin, cutting into strips of about 3 inches wide and 10 -11inches long, oiled lightly then folded in half first x-wise to make a length of 5+inches, then lengthwise to make a narrow piece. Then, that is artfully knotted and steamed in the multi-layered steamer, served w/ lentil-veg stew. It is pretty, tasty and very filling. Namgyl's brother planned to drive back to Leh Tuesday afternoon, so we wanted to finish up that morning and hitch a ride w/ him. We walked up the canyon from their home probably a mile, looking down on the monastery! As we descended, we stopped at each house to inquire about needs. Another dehorning, checking the broken leg and the usual treatments took all the time before school. His brother was kind to drive us up to Shilla later to recheck the two lamenesses, both improved. The dzoh is about 15 years old, so we can not expect a return to great mobility. (The walk is pleasant, but a long ways for just 2 rechecks. Still had to walk about 1/2 mile and cross that creek a couple times). The neighbor lady is so friendly and sociable; always wants us for tea although she knows no English and our Ladakhi is confined to animal, anatomical and family words, such as father, mother, child, etc. But, over we went to please her, which our presence did. Then we packed our bags, said our sincere farewells and were ready for a 3 pm departure to town. This road may be the main highway, but it is not for the faint of stomach. Wanla is at the end of a very narrow canyon drained by a river; that secondary road is very twisty, but NH 1 is also. I can't think of any stretch more than 1/2 mile at most that is either level or straight, let alone both. Besides cars, many lorries filled w/ produce and goods from Kashmir were chugging along; these are garishly painted 3-axle trucks about the size of our dump trucks, but cab attached to the bed as a pick-up. The sides are about 12 feet high so much weight be carried. As I mentioned, the road over the high pass to Srinagar opened very early so Ladakhis (and us!) are enjoying more fresh veggies than we have ever seen. Also on the road were many military personnel carriers; there must have been some sort of exercises, as we saw paratroopers land in the valley across from Matho and hear planes first thing every morning. More on that another letter. Since that part of the Indus Valley is considerably lower than Leh (only about 10,000 ft. elevation), the apricot blossoms filled the landscape w/ their pink and white beauty against the 50 shades of brown of mountains. Now some are leafing out as are the poplar trees, a pretty apple green. Ah, a shower again to wash off all the dust. Now I understand the importance of oil as mentioned so often in the Bible--our skin is parched! I finally have augmented my creams w/ vaseline to try and soften the skin. Another wonderful evening of fellowship w/ the Gergans, no internet, which always disappointing, but a good book w/ which to end the day. Now we plan to return to Matho where we were a couple weeks ago, but did not complete the rounds. We hope this finds you all well, enjoying spring blooms and a return to nice weather. We look forward to hearing from you! This will hopefully be a shorter note to finish our work in Matho, the village east of and some higher than Leh. We went out Friday afternoon (April 13--Amy's birthday!) so we could have the weekend w/ Delden and he would not have to miss more work. Because we could not find a ride, Howdy made arrangements for a taxi, which is not very expensive. This is the same driver that Rev. Gergan likes and who took us out to Khaltse. Now, enroute to Matho he stopped at the local butcher shop--a stall about the size of a single garage w/ a man sitting behind the counter, which is right at the sidewalk. Driver asked for some chicken, but not a whole bird. The guy picked up a carcass and a 10 inch scimitar w/ which he deftly halved that--glad my fingers were not in the way. The piece needed was paid for, wrapped in a piece of newspaper (as are all purchases) and we were on our way. Delden's family welcomed us warmly and fixed timos for our supper--such a work of dough art. We were on our way to the farms first thing Saturday, walking and taking in the beauty of the surroundings. So many Psalms mention hills reverently; the writers had no idea what the Himalayas inspire. The first cow treated was owned by a pleasant man who inquired about Howdy's age and was delighted to learn they are the same, so we had to get a picture of the two 75-year olds. Besides a cow w/ some abrasions that we cleaned, the morning passed uneventfully. Unfortunately for us, Delden had to take his wife to the doctor's in Leh that afternoon so our day was cut short. He took us up to the monastery on his way out of town, where we had extraordinary views of the valley; could see the Shanti Stupa above Leh, about 25 miles west. The alluvial fans below the steep peaks to the north lead down to the river; the villages are tucked up at the rise. As we walked down, we watched a family debarking large trunks of poplars that will be used for the roof and ceiling of their new home. I have mentioned before that soldiers who serve 15 years get a nice bonus which many use to upgrade their homes. Matho has many new houses, some with a separate glass-walled room holding their solar hot water heater and bathing facility. Some are constructed w/ cement bricks rather than mud; these may look nice but do not hold heat and do not recycle. In contrast, Delden's aunt and uncle live in the same house where perhaps she grew up--she, her husband and D's dad were born into that village, so Delden's daughter is 4th generation, at least. The old house holds animals on the ground level and the family lives in an 8x8 room up scary stairs. Other rooms are on the second level but not heated, so not used by older residents except for storage. When we teated their cows, of course we had to have tea and state our ages. She also is 74; delighted to be the same age as her guests. Delden' brother was in charge of dinner; when I offered to cut vegetables for the soup (thukpa) he took me up on it. A large cloth was spread on the floor to catch the peels from the cutting board; I diced cabbage, potatoes and onion. Thankfully, sitting on the floor is not hard or I would be in big trouble. His mom was tired from shoveling the little canals in the field near their home that had been plowed and ready to irrigate before sowing the barley. This open area over 1000 feet higher than Leh is cold when the wind blows, as it does most afternoons. We keep warm at night in our sleep sacks, sleeping bags and one heavy fleece blanket (which they call a quilt) over us. Mornings are so bright and beautiful; we dress quickly and head for that hot water. Sunday morning Delden returned about breakfast time, did chores quickly and was ready to head out. This day we drove, although sometimes the house to be reached is a quarter mile off the road. The hard case for the day was finding a cow in a narrow shallow ditch between the house and 3 foot rock wall. She apparently had fallen, perhaps from further up above the wall as she had many abrasions on her back and flank, but no one had been able to get her up to see if she had a broken limb. Howdy and those around tried, but she was not moving, so he gave her some injections for swelling and pain, then urged the owner to provide food and water to give her strength. Happily, the cow with severe pneumonia we saw on our first visit was much better, so we finished up the village by dehorning two more cows and giving more good vitamin B injections. D needed to return by 4 pm to help get the irrigation going, so Howdy wanted to call the guest house to see if we could return early. This is getting ahead of my story, but Leh has been inundated w/ students from Thailand! This is a long break from school, apparently, and they are here in droves. Our room had been given over to some as the innkeeper thought we were returning on Monday--which we did, as the guest house was totally full Sunday night. So, we did stay and enjoyed momos for dinner after the irrigation was working. I helped slice and dice, but we did not eat until 9 pm. By then our eyes are heavy and appetite supposedly diminished but we did manage to put several away. Village life is hard; they are dependent on the weather, concerned for diseases and now the warming that is bringing spring earlier and melting the glaciers at a rapid rate. Yet, watching a people still living by the rhythms of the seasons is heartening--we dwell in such an artificial world of our own making that we are taken by surprise when natural events interfere w/ our routines. 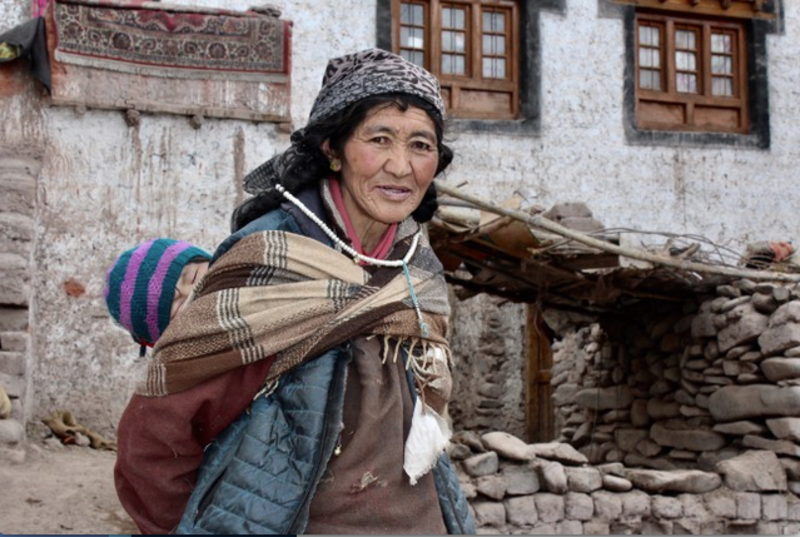 We have been privileged to see how people of Ladakh have lived for centuries, and now how they are coping, embracing or enduring the aspects of 'modern life' recently introduced by communication and technology. We hope they choose the best of both worlds. Our bags are open while we try to sort our goods; as we pack we are reflecting on the time here and how fast it has gone. This has been such a satisfying almost 5 weeks in Ladakh, 12 nights of which were in the villages. To close these journals, I will give you a few more reflections of Leh and the surrounding area, just brief observations of life in this remote part of the world. One of the hardest adjustments for us is the capriciousness of the government and perhaps the power company in providing electricity and internet service. One never knows when the computer screen announcement reads. SERVER NOT FOUND. and you know to turn it off, with in the middle of a sentence. The guest house owners have complained about the difficulty of doing business, booking prospective visitors, because requests can take days for a response to be sent. I have been drying my hair and had the power suddenly switch off. Of course weather interferes w/ some routines: as everyone rejoiced when the road to Srinagar opened early, it has now been closed twice for a day or more--once we heard the military had shut it down (lots of unrest in Kashmir right now as Indian army officers shot two Pakistanis) and once for a late snow. One does not depend on anything out of his control. As we drove west, we could see cable being laid near the road for IT connections, so soon some of the villages will also have internet; how it will work is another story. The military: as you know, Sikh men wear large turbans, a problem for uniformed soldiers. This was solved by issuing them Army green turbans. Over half of the population of this region are military forces; they were apparently conducting some exercises as one day while in Matho we saw paratroopers landing in the large plain across the river and all of our travels on the road have been slowed by convoys of truck carriers. While I know that India is defending two borders, China to the north and east, Pakistan to the west, I think about the 35 million sub-continent Indians w/out water or electricity and wish some money could be allocated to Human Resources. Meanwhile, Leh is a small confluence of Asian peoples. The Tibetans are by far the majority, Buddhist and Ladakhi speakers. Both Sunni and Shia Muslims live fairly peaceably w/ one another and the other residents; we were surprised to see some women veiled, a new notion here as women have many opportunities for both study and employment. Their language is Urdu. Many of the military speak Hindi, but understand Urdu. The migrant workers include those from Bahari, the very NE part of India. They are small in stature but so strong; lifting 80 or more pounds. They build the houses and hotels, often also employed as the house boys in the lodgings. The Nepali workers do the heavy construction of roads--very brutal conditions lifting heavy rock and hauling cement in gunny sacks. Both men and women (and children) come from that country. Then the carpenters who make the furniture, paint and plaster for the many hotels are from the Punjab, the part of India south of Ladakh. Tourists are coming earlier, especially from the southern parts of India where the temps reach 100 deg. or more by early April--this has become the newest destination. We have seen several Chinese walking around, and some Europeans are venturing out, but real trekking does not start this early. New restaurants seem to open every day, many trying to cater to foreign tastes rather than providing the standard Ladakhi fare that we think is quite good and so reasonable--we can get a plate of flavorful noodles and veggies or rice covered w/ stew and tea for about $3.00 total. One of the new additions is the coffee shops--tea costs 20-50 cents a cup, depending on the variety, so many good choices!, What always was offered as coffee, that is a cup of hot milk and a jar of Nescafe + sugar cubes (not too bad, cheaper than a Starbucks latte) is about the same price, but 'real' coffee, new on the scene, brewed w/ beans, is closer to $3 a cup. The produce stands are so full of beautifully colored veggies, provides abundant cucs, tomatoes and delicious melons; we have never had much in the way of veggies and fruit before. But, carbs are the staple; one could be a vegetarian here (if eating eggs and cheese was okay), but no one who stays away from gluten would survive--three meals a day are full of flour. Most meals are meatless, but sometimes, especially in homes, a luxury is a bit of mutton or chicken in a dish. Because of the way the pieces are cut, w/ that long cleaver and not at joints but to sell a weight portion, we find bone fragments in the small pieces of meat. I thought I was very careful, almost pureeing each bite before putting in my mouth, but alas, I came down on a hard sliver and broke my front tooth. We have been delighted to be in many homes, mostly for tea but to see the interiors. Lavender, a color used in the US only for little girls' bedrooms, is very popular here in any room. This is the first year we have seen refrigerators in most all the houses--I thought they just put food in little alcoves to stay cold. However, this is yet another ramification of global warming; winters are shorter and summers are warmer. Some homes now have a pre-finished thin wood flooring rather than the carpets; the latter are more colorful (no concern about patterns or colors matching) but certainly harder to clean. No one wears shoes inside the house, but at the door are an array of the plastic crocs or shower slippers so they can go in and out w/out stopping to tie shoes. Where we needed every inch of support from our hiking boots as we climbed the rocky trails, they scampered up in these slip-ons. Rotarians will be happy to know that polio vaccines were given earlier this year; I think it as been eradicated here. Vaccinations for other childhood diseases are stressed on posters and even TV; besides the usual DPT, etc., one for childhood TB was advertised. As I mentioned in my first note, the tourism business here is overwhelming; we have seen 6-floor hotels going up. In past years our walk home from the Gergans in the evening was time for a quiet conversation about the day; now we are dodging cars and great numbers of motorbikes (4 rental shops in one block) each evening. The polo field is totally full of cars, the biggest parking lot in town. Two last reflections on our status as westerners: politics are big in India, as the prime minister (Modi) is a Hindi nationalist who does not seem to respect other religions. The party is not trusted because of corruption. When we are asked where we are from and answer "the US", anyone who speaks English has an unkind word for the present president. Obama was well received here, but no one can understand how this happened. Although we can not, both because of language barriers and political constraints, share our faith openly, if anyone asks, and they do, why we are here helping, we can safely answer that the God who loves us asks us to care for one another. That is well received. Just today an official asked Howdy about the meaning of Easter. So, we pray that the seeds we have planted will at some point grow. We are off on Tuesday for Delhi, then on to Italy for a few days before returning to the real world of work! We hope you have enjoyed touring Ladakh w/ us and will keep n touch.